Safeguarding Adults is delivered over one three hour session. 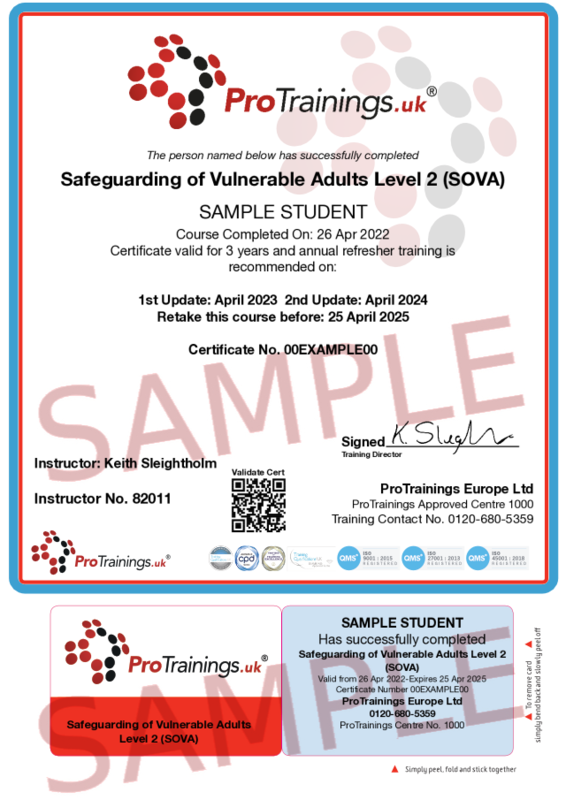 The course aims are to promote awareness of what constitutes abuse and neglect, promote understanding of the different types of abuse and neglect, promote understanding of what makes individuals vulnerable, promote understanding of what disclosure and whistleblowing are, and detail legislation relevant to Safeguarding of Adults. By the end of this session, candidates will be able to identify types of abuse, identify when abuse has happened/is happening, understand how to report and record issues that may be witnessed or disclosed, and understand how to help prevent abuse and neglect. This course comes with 3.0 hrs (4.0 class) of CPD, although the time to complete the course online may be less than this. Total course time includes 1 hour and 54 minutes of video training as well as knowledge reviews, final test, remedial help and reviewing downloaded material.